Join us this Thursday, July 29th at 5pm (we will meet in front of The Radha Yoga Center 406 S. Coeur Dalene St.) for a trail walk above Overlook Park as we see the newly restored walking path and learn about the local ecology from The Lands Council. 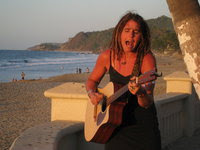 Then at 6pm we will head over to the park and listen to the awesome tunes of The Angela Marie Project. An acupuncturist by day, a singer/songwriter by nights and weekends, Angela Marie is wowed by her current band. All songs performed by AMP are written by Angela Marie. The songs are inspired by world travels, love and mystery of daily life and the beauty of the Northwest. **Thanks to Sherry Pratt Van Voorhis, P.S., The Elk, Cafe Luna and The Lands Council for making this night happen!